Other people want this. 18 people have this in their carts right now. Here is a chance to try out the beautiful sparkly holographic colors before committing to any particular one! All the glitters are solvent resistant and can be used to make nail polish or for other crafts. Each bag contains one teaspoon of glitter. Use promo code WELCOMETOPAPER for 15% off your first order. Use promo code WELCOMETOCOLOR for 15% off your first order. Whereas the Solvent Resistant Glitters are guaranteed by the Manufacturer as solvent resistant and can be used in nail polish, we at The Glitter Source cannot test our glitters in all of the possible nail polish bases and solvents and cannot guarantee how they will perform in each situation. The Glitter Source recommends that customers who are concerned about solvent resistancy test the glitter in their nail polish bases beforehand. Beautiful. Consistently solvent resistant so far! I received the items quickly. I haven’t used them yet but the glitter in the package is beautiful. Absolutely lovely selection that stays nice and shiny even through strongly pigmented resin. Love the white glitter the best- it goes with every color I cast for a nice subtle effect. Love the colors!!!. Will be ordering more soon. Refunds will be given for damaged items. The item must be returned within seven days of the delivery confirmation date. Please convo me if there are any problems. Cancellations and Returns are at the discretion of The Glitter Source. If a product has already been processed and shipped there will be a minimum of $2.50 charge or 15% restocking fee - whichever is greater. Once The Glitter Source has agreed to a refund it will be issued upon the return of the item to the store. We try to provide answers to most of the questions, requests and inquiries we receive on our Etsy store, Facebook page and website. Check back occasionally as we are always updating our FAQ’s. Q. What type of Glitters do you sell? A. We sell a large variety of glitters that can be used in a variety of craft, decorative and nail art applications. We carry a growing selection of glitter colors, glitter shapes and glitter sizes. The bulk of our products are Solvent Resistant Glitters that are compatible with Franken Nail Polish. Q. Are your glitters imported from China, Taiwan or Korea like what you get at Michaels and other retail stores? A. We source most of our glitters from domestic sources. We proudly sell Made in America products. We import a few specialty glitters. Q. Will you be introducing new glitter colors, shapes and sizes? A. We make it a priority to introduce new glitter products all the time. Check back often at the website or Etsy store. You can sign up for our email list for notifications and special deals on our glitters. Like us on Facebook for frequent posts about our glitters. Q. Will you create a custom listing? A. No, or general policy is not to do custom listings. Any custom listing would be a $100 minimum order. Q. Do all glitters weight the same? A. No. Some glitters are heavier than others. For example, the very small 0.008 hex glitters are the heaviest. The larger the glitter size and shape, the lighter (less dense) the glitter is. Q. What size packaging do you use? A. Our standard package is a 2 x 3 inch ziplock baggie. For our sampler sets we use small mini bottles as well as 2.0 x 2.0inch ziplock baggies. Our lighter weight glitters contain 1 Ounce by volume. Our heavy glitters (0.008 Hex, 0.015 Hex, 0.04 Hex) contain 1/2 ounce by weight. Q. What is the weight of each package? A. We fill by volume and so each package weight may be different based on the density of the glitter. Finer glitters (0.008, 0.015 hex, 0.04 hex, 0.062 hex) contain at least 14.2 grams. Larger glitters - such as large shapes may contain less by weight but contain the same Volume as all of the other glitters. Please note that we fill by Volume based on a specific package size and not by weight. Q. Do you offer larger sizes? Do you sell in bulk? A. We do not offer our glitters in bulk. Q. I’m a blogger, do you send free product to blogs for review? Q. What type of payment options do you accept? A. Our payments go through Paypal. Q. How do you ship the glitters? A. We ship almost exclusively through the US Postal Service using First Class postage. We ship internationally to all corners of the globe. We have almost no record of delivery issues. Q. What type of shipping containers do you use? A. We use a variety of shipping methods. Most of our smaller orders are shipped in a padded mailing envelope. Larger orders are shipped in a simple corrugated box. 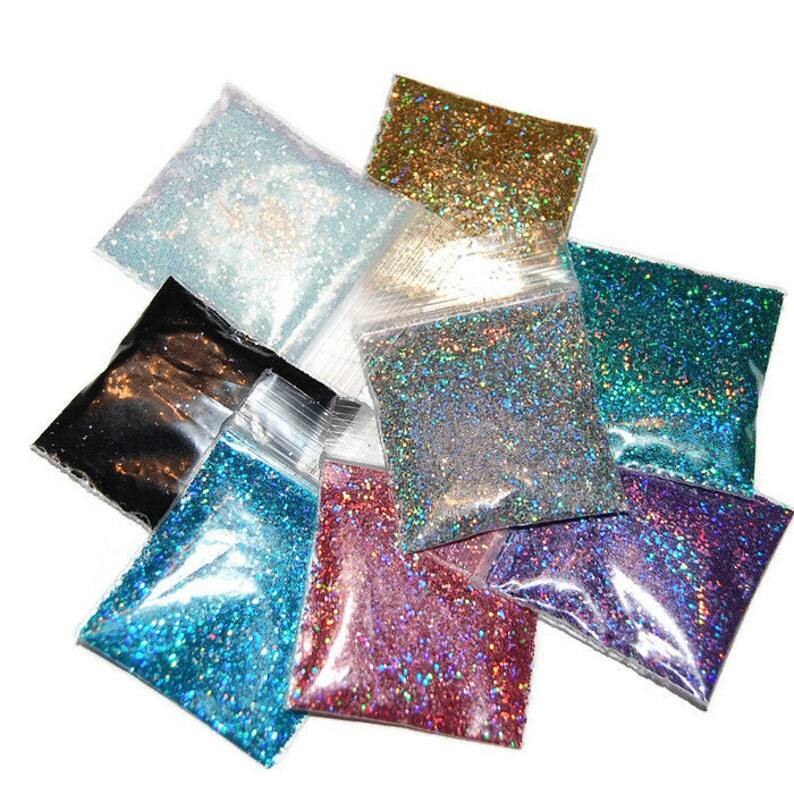 We package the glitter baggies inside a separate plastic bag to provide additional protection from any damages that might occur during shipping. Q. Can I get an expedited shipment? A. We make every attempt to ship within 2 business days of receipt of an order. For most domestic customers that means they will get their orders delivered in 3 days or less, often the next day. We can accomodate expedited delivery, however please be advised that there would be an additional cost. Q. Do you test all of your Solvent Resistant Glitters? A. Whereas the Solvent Resistant Glitters are guaranteed by the Manufacturer as solvent resistant and can be used in nail polish, we at The Glitter Source cannot test our glitters in all of the possible nail polish bases and solvents and cannot guarantee how they will perform in each situation. The Glitter Source recommends that customers who are concerned about solvent resistancy test the glitter in their nail polish bases beforehand. Q. Do you have a return policy? A. Refunds will be given for damaged items. The item must be returned within three days of the delivery confirmation date. Contact The Glitter Source if you experience any problems. A. Cancellations are at the discretion of The Glitter Source. If a product has already been processed and shipped there will be a minimum of $2.50 charge or 15% restocking fee - whichever is greater. Q. Do you accept special requests? A. It is our objective to provide great customer service and offer the highest quality selection of products. We will consider most requests and make every effort to accomodate the needs of our customers.